Bobby Sing is a film critic from India who has deep passion for writing about films. He has been garnered with tremendous respect by his readers for his writeups about cinema of all ages , cinema of all regions in country. His dedication for his passion was one criteria that we at Studio CarryOnHarry , Singapore invited him to join and share his story and his view points about films made in one of biggest film industry in asia . 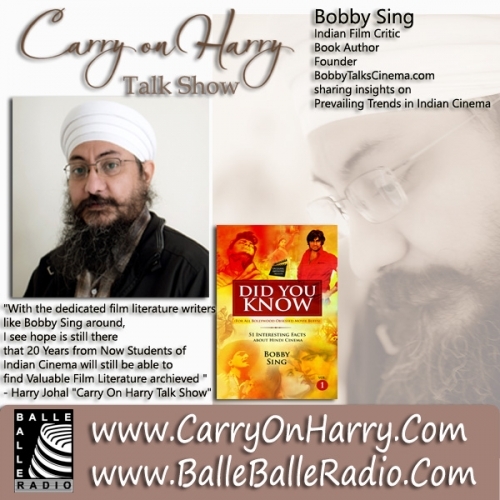 Bobby and show host Harry tried to touch various issues surrounding the way indian films are being made. Personal view points kept flowing from the expert about regional cinema in india , ignorance of some world class cinema still happening in non popular zones of india.His view points about star system , corporate kind of film making that have stolen the cinema that use to be made. Bobby explans how reading reviews has been less of an interest for audience than discussion about collections by fans of indian cinema.He very nicely explains terms like groupism , and how films are justified of being successful through collections and ignoring the content. His appearance on talk show was also intended as complementing and encourage him for great services he is delivering by trying to educate people about type of cinema that Indian film use to be known for. We hope you will love viewpoints exchange on the show.